Buckeye Valley’s Andy Anthony squares to bunt during Tuesday’s MOAC showdown against visiting Pleasant. DELAWARE – When Pleasant’s Robert Curren lined the first pitch of the game into center field, it was just a preview of what was to come. 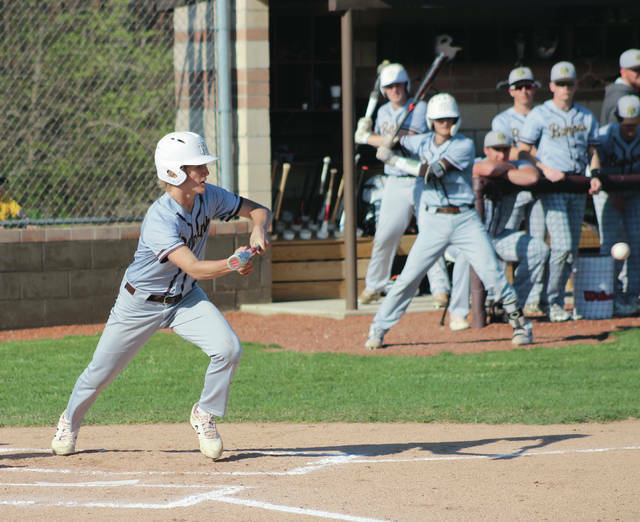 The Spartans pounded out 19 hits en route to a 10-6 victory at Buckeye Valley in MOAC play Tuesday night. Both coaches thought the game came down to their respective teams’ approach at the plate. Curren and Owen Peters both singled in the first inning and scored an out later when Zane Dine lined a single to right. Braxton Reed followed with an RBI double to give the Spartans a 3-0 lead they never relinquished. Jonathan Curren added an RBI single in the second and Dine another RBI single in the fourth inning before BV found its footing offensively. The Barons scored three times in the fourth inning to cut the deficit to 5-3. Ben Atiyeh reached on an error with one out, Hunter Moffatt singled and Logan Adkins was hit by a pitch to load the bases with two outs. Two runs scored when Mason Kurtz sent a roller up the middle that was cut off at short, but the throw to second was wide. Adkins scored from third on an errant pickoff throw to first. But, every time BV rallied for some runs, Pleasant had an answer. Bryce Lowry and Jonathan Curren each had RBI singles in the fifth to push the lead to 7-3. Andy Anthony drove in a run on a squeeze bunt in the sixth inning after a couple of errors and a hit-batter had loaded the bases. But, pitcher Brennen Newell stranded the bases loaded with a strikeout after an intentional walk had loaded them again. “We need to do a better job at the plate of not chasing off-speed pitches in certain counts and situations – getting back to who we are and what our philosophies are at the plate,” Kirby said. Pleasant responded with three straight hits to open the seventh before a Dine walk drove in a run. Lane Russell added a two-run single with two outs. BV rallied again with two outs in the bottom half. Moffatt was hit by a pitch and Adkins doubled to set up a Kurtz two-run single to account for the final margin. Peters went a perfect 5-for-5 at the plate and scored three runs, Robert Curren added four hits and a couple of runs and Dine drove in four runs to lead the Spartans (7-7, 3-4) offensively. Newell allowed two earned runs on six hits, four hit-batters and a couple of walks and struck out six to get the win for Pleasant. Atiyeh went the front four innings and allowed five runs, four earned, on 11 hits and struck out five. He took the loss for the Barons (6-6, 2-3). Neither coach feels like their teams are out of the championship race yet with Clear Fork and Galion atop the standing with one loss apiece. BV handed the Colts their only loss and Pleasant knocked off the Tigers. “I think we’ve got a very talented group of baseball players,” Kirby said. “It’s just putting it all together. We split with (Clear Fork), we split with Ontario last week and we’re looking to split with Pleasant when we see them again tomorrow. BV and Pleasant meet again today at 5 p.m. in Marion.